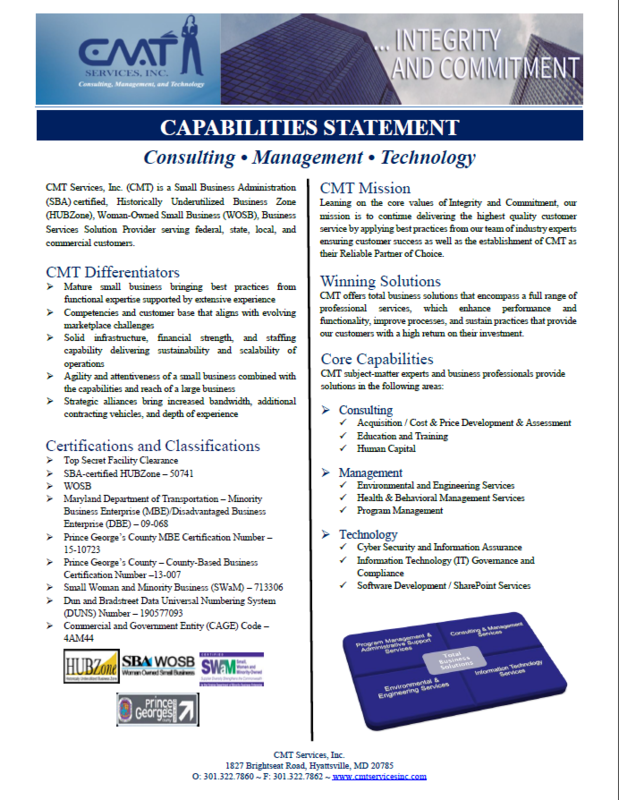 CMT Services, Inc. is an industry leading Consulting, Management, and Technology solutions services provider to government and commercial entities! Our clients benefit from our flexible and scalable solutions to address their unique business challenges and needs. We offer a unique array and ‘Real World’ expertise in Cost and Price Proposal Development/ Acquisition Support, Education and Training, Clinical Services, Environmental and Engineering Services, Human Capital and Information Technology. As a SBA-certified HUBZone, Woman Owned Small Business (WOSB), we deliver quality, professional services to support the missions and strategic business goals of our clients. Santa L. Molina-Marshall, LICSW, SEP – joins as Senior Advisor to CMT Services, Inc.